This is the Feng Shui elements article part two. b) The Melodic Feng Shui elements. Each element has different propose. They are calculated using the birth year of a person. In term of the Melodic Feng Shui element, unlike Gua numbers, they are no change between male and female. Regardless of the gender, born in the same year, they carry the same Melodic element. You can go back to Feng Shui Elements post to read more about them. 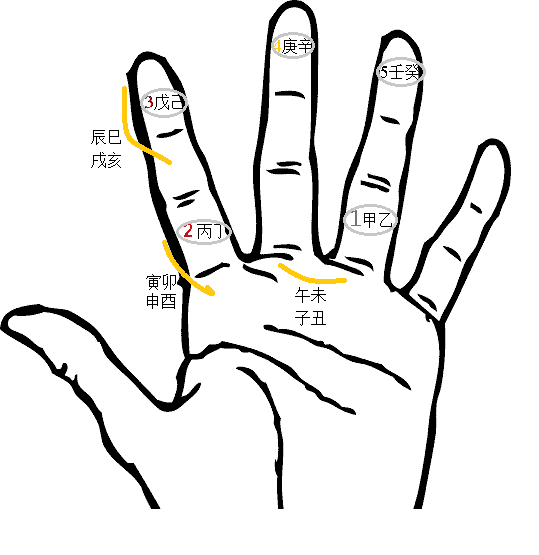 Now, let’s continues…to Feng Shui elements part 2, to quickly find out the element of a birth year using our palm. You need to remember these 5 numbers and its elements by heart. 1 = Wood, 2 = Metal, 3 = Water, 4 = Fire, 5 = Earth. Here is the Feng Shui melodic elements formula. Add up the number of Heavenly Stem and Earthly Branches. If the sum is greater than 5, take 5 away. The remainders must be in between 1 to 5. If the remainder is 1, it is Wood. If the remainder is 2, it is Metal. If the remainder is 3, it is Water. If the remainder is 4, it is Fire. If the remainder is 5, it is Earth. For example: 1990, the Stem and branch is 庚午. Look at the palm. 庚 is 4. It is 5. So the melodic element is Earth. If you don’t want to memories it, you can use the following table.